It’s actually a really good post, filled with useful tips on how to build good habits to come up with ideas, and create a blog writing workflow that removes barriers. Seriously, you should read it. Maybe it’s just me, but I can’t write a great blog post in 15 minutes. There have been rare occassions where I have written GOOD blog posts in 15 minutes, but usually it takes much longer, even just for a mediocre blog post. A GREAT blog post? That is rare. GREATNESS is rare in general. So I want to talk about how to create a great blog post in 15 DAYS. Not minutes, not hours, but DAYS. Because if you can create a GREAT blog post in 15 days, that is pretty special. I think that should be recognized more often. This isn’t fast food – this is GREATNESS. I find that my best work comes from observing the world outside of the topic I write about. That is why so many of my posts use music as a metaphor, talk about history, or how personal experiences relate to the shifting role of publishing and media. Look to nature, look to other markets, listen to those who are wise, but outside of your industry. Get out of the echo chamber of your niche. Ever notice how a few “issues” seem to dominate headlines for awhile, and then are forgotten for new ones a few months later? Don’t focus on the short term, look at issues that affect your community in the long term. Look for topics that are critically important and under-reported. Sharing a variety of ideas and perspectives can take a bit of commentary from good to great. String together your best ideas to take things to that next level. Consider how different issues relate to each other. The problems facing your community are often much more complex than people make them out to be. Treat the topic with the respect it deserves – don’t simplify. When I write, I may create an outline, and work across multiple drafts. Sometimes these are spread out on two computers, my iPad and my iPhone, as I sketch out ideas over time. I try to bring them together to sort them out, and give the post a purpose and structure that has the most value. Oftentimes, other folks will have written about the topic you are covering. Don’t be afraid to find out what they shared, and integrate their work into yours. There is nothing wrong with building on the work of others, as long as you give credit. Sometimes walking away from an idea is the best thing for it. Give a blog post room to breath. Write a solid draft, then take a few days away from it. I do this with a lot of things I create. It’s common for me to get a PowerPoint presentation 75% done, walk away from it for a day or two, come back and revamp the entire presentation. Yes, it’s more work, but the end product is better for it. The goal is not the PowerPoint, the goal is how it helps the audience I present it to. Send out emails, pick up the phone. People are flattered when you ask them for advice, and would love to be seen as an authority in their field. Don’t be afraid to leak out your ideas to a select few in order to get their input. Challenge your ideas. This will only make them stronger. I often spread out my efforts for a blog post across multiple writing sessions, coming back to it again and again to slowly make it better. This alleviates the immediate pressure to create something amazing in one sitting, and gives you time to process it between sessions. When you can approach a blog post with fresh eyes four separate times, it is likely to be better than if you only looked at it once. Headlines are really important to convey the value and benefit of a blog post. Spend time on them. Consider not just if it describes the topic you are writing about, but if it is compelling enough to encourage people to click. In all likelihood, this huge effort you put into the full blog post could be lost if your headline isn’t great. You may want to consider doing keyword research, and see what types of headlines have worked well for you in the past, or for other bloggers. For many well established bloggers, their ideas and posts are spread so widely because they have established circles of colleagues and friends. These are people who seem to work together to share ideas, to comment on ideas, to spread ideas as far as they can. To give them wings. Build these relationships in your market. Depending on the topics you cover, you may have to focus on many different sub-niches. Content isn’t everything – relationships matter. It’s easy to write long, and very hard to write something of value that is also concise. Don’t be afraid to chip away at your blog post, cutting it down to the very best bits. Don’t feel that because you spent days or weeks on it that it needs to be long. Some of the world’s best songs are incredibly short and simple. Blog posts can be the same way. Put another set of eyes on it, allowing them to check not just grammar and spelling, but the overall flow and purpose of the piece. It can be hard to create in isolation, involve others in the process. It is amazing how quickly information spreads on the web and via social media. Take a moment to check your facts. Don’t always reach for the ‘publish’ button before doing so. One incorrect fact can ruin your entire effort and tarnish your credibility for a long time. Don’t take the risk. How does this blog post relate to the rest of your blog? How can you set yourself up for where this post will lead? Is it part of a larger topic you cover? If so, how can you link to them? Will you be covering this topic in other ways? When? How? Consider these things before you publish. An inherent part of the content creation process is sharing. How will you deliver this blog post to the world? Are there particular people that you want to share it with, are there certain communities who will appreciate it most? Reach out to them, get them involved. There you have it. If you are lucky – REALLY lucky – this 15 days of work will not just have resulted in a great blog post, but actually pushed ideas forward within you and those in your community. And that is how these these types of things should be measured – how did this blog affect those you are trying to serve. How did it help? You can’t measure this by page views or ReTweets. And I DO NOT mean that it is measured by “influence,” a weird term that was being talked about in social media recently. The goal is to help, not to fill content buckets with new Tweets and blog posts. 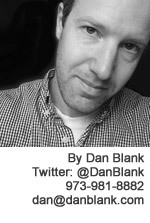 Let me know if I can help you in growing your blog: @DanBlank, 973-981-8882 or dan@danblank.com. Next Next post: Are Books, Magazines & Newspapers Dying? That’s Up To You. And Me.